Thank you for stopping by! I’m glad you are here! This blog is where I will list the current events, sales and promotions going on with Heritage Makers. But first and foremost I want to encourage you to sign up for your free account at Heritage Makers . Have a look around and see for yourself the power of personal publishing with Heritage Makers! Best part is that it’s FREE to look around and it’s even FREE to create a project! You only pay when you publish your project. So, three ways to publish your stories: BASIC Account, PREMIER Account, or CLUB HM Account. The best deal is CLUB HM! Joining Club HM is simple: Just choose a membership level and you’ll receive 30-100 publishing points each month. 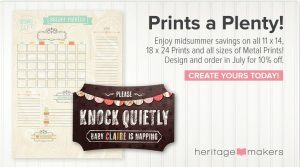 Use them to order a completed project or save them up for a special event. Publishing points are useable for up to 24 months, depending on purchase date. Your Club HM membership has no extended commitment, you can cancel or adjust your membership level at any time. Changing your club level is so easy and it’s done by you online in your own account with a click of the button. No waiting forever on hold with customer service! You control it when you want! So, you want to try Heritage Makers but maybe you’re just not sure which way to choose for publishing your project. No worries! What I tell people is try publishing your first project with your free basic account and experience the high quality for yourself. That’s what I did. And then I was hooked! This month 11×14 and 18×24 prints and all sizes of Metal prints are on sale! So go to Heritage Makers and have a look around! And please let me know if you have any questions!